Fugitive leaker Edward Snowden said Saturday he believes the Supreme Court will review the legality of the U.S. government's mass surveillance programs and ultimately find them unconstitutional. "These programs themselves are unconstitutional," Snowden said during an interview with journalist Jane Mayer at the New Yorker festival in New York City. "I am confident that the Supreme Court will agree these programs went too far." Snowden cited a ruling by a federal judge last year that found the National Security Agency's bulk collection of American phone records likely unconstitutional as one reason for his confidence. He also noted that two presidential advisory panels have raised concerns about the lack of judicial oversight of the agency's programs. Snowden, appearing via a video stream, was responding to a question from Mayer, who asserted that the dragnet programs Snowden exposed last summer were legal. Most whistle-blowers, Mayer said, have come forward to shed light on illegal activity, making Snowden's situation different. 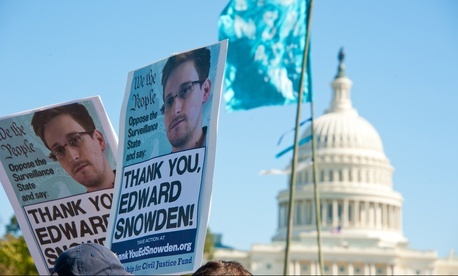 Snowden disagreed, saying he "would dispute that no crimes have been shown." He pointed to government officials who appear to have lied to Congress under oath, and said the programs have been routinely abused by employees. "We have had serial abuse from NSA agents spying on exes, lovers … never prosecuted. That's a felony," he said. Snowden also addressed recent moves by both Apple and Google to ensure tighter encryption protections on their phones, saying the measures only go so far. Spies and law enforcement officials can still obtain records from phone companies, and encryption does not protect data uploaded to cloud services, such as iCloud, he said. "Even if encryption were this unbreakable, impenetrable shield, we live in the cloud era," Snowden said. "That data [in the cloud] is not encrypted." He blasted concerns raised by some officials, including Attorney General Eric Holder and FBI Director James Comey, that such safeguards could impede criminal or national security investigations. That complaint is "not only ridiculous, it's offensive," Snowden said. Snowden's interview came a day after the screening premiere of a new documentary that provides an intimate look at Snowden's rendezvous with journalist Glenn Greenwald and filmmaker Laura Poitras in the days leading up to the publication of documents revealing details of the NSA's sweeping phone and Internet surveillance programs. The film, Citizenfour, is directed by Poitras and reveals that Snowden's girlfriend, Lindsay Mills, is now living with him in Moscow, where Snowden remains in exile. "She was not entirely pleased," Snowden joked to Mayer when asked to describe the reunion after more than a year apart. "Although she had a very, very challenging year, and I'll leave that to her to discuss, it was a meeting I'll never forget," he added, while apparently wiping a tear from his eye.